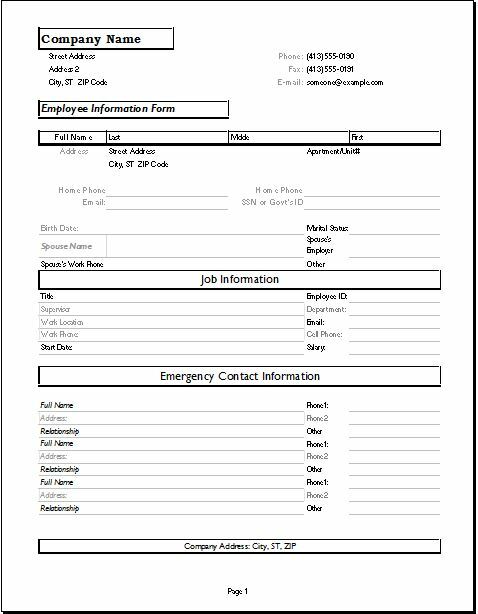 What is Employee Information Form? 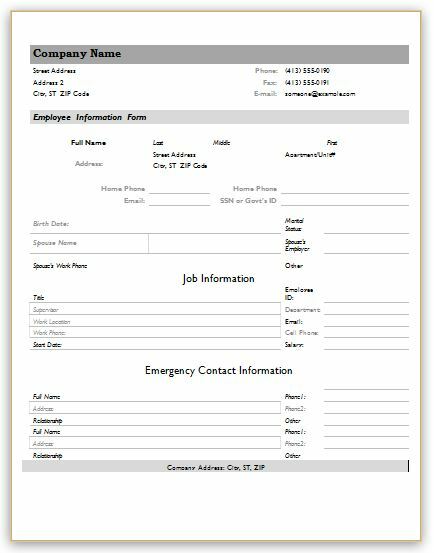 An employee information form is an important form which contains all the mandatory data about the employee working in the company. All reputed and prestigious companies have the record of their employees through the employee information form. The employees have to undergo through filing this document at the time of hiring so that the company has the record which let them track the details about the employee whenever they want. Our employee information form provides the option of mentioning the company details such as the company name, company location, and its contact number. In addition to this, the most professional way of communication which is an email id can also be mentioned. The employee has to fill the data which includes some basic information about him such as employee name and his residence. In addition to this, the name of the spouse and contact details also need to be mentioned for which we design a proper place. It provides option about the nature of job and designation with the employment ID. The date of which the employee joined the company is the required details which employee has to mention. Besides this, the salary for the peculiar designation for which he is assigned can be mentioned due to our professional employee information form. All the data regarding whom the company should contact in case of any emergency, such as accident etc. needs to be provided. Our employee information form gives the facility to add this mandatory information that may help the company in future. Get the most brilliant design template having all the necessary options and fields to be mentioned by clicking the button given below. Download it and use it for having the details of your employees. → EXCEL file format: Fill all the details regarding the employee in the Microsoft Excel sheet. → Instantly printable: fill out the fields and get the print. → Blank sample: Use it whenever you want. → Intuitive design: It is the professional format having all important fields in it. → Fully customizable: Edit it according to your company’s need and policies.